In 2013, an Ebola outbreak inundated several West African countries, triggering a two-year long epidemic that commanded international headlines and everyone’s attention along with it. 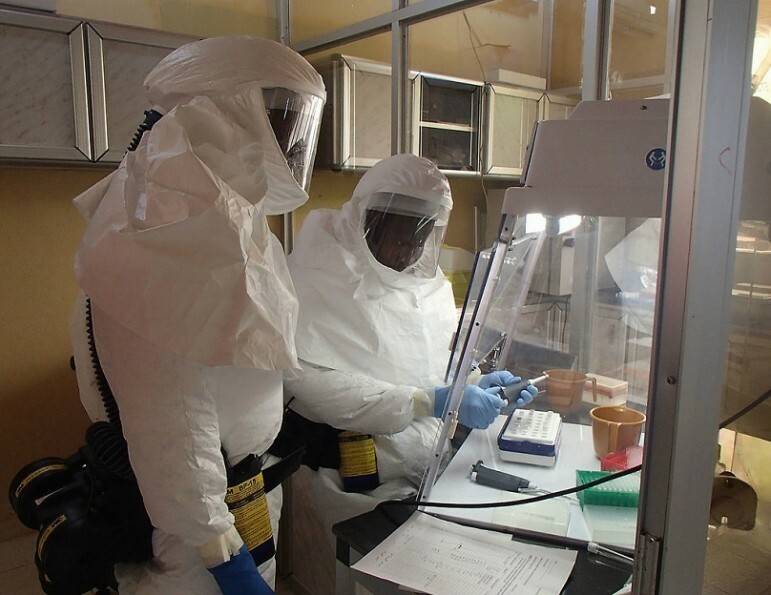 The World Health Organization’s (WHO) announcement of the end of Ebola transmission in specific countries, including Guinea, Liberia, and Sierra Leone, came as recent as March of this year. Despite the culmination of the transmission of the disease, many in certain regions across the African continent are finding that the plight of Ebola is far from over. One particular population, childbearing women, is suffering through yet another disaster of sorts that is plaguing maternal health and the system in which it is delivered. In a visual piece published in the New York Times earlier this week, the aftereffects of the Ebola crisis on women and their newborn children—some of whom live just hours or days after their birth—are captured in intimately sobering photos taken by American photographer Monique Jacques. The album and accompanying stories of the women, who have little choice but to give birth in settings where running water and availability of sanitary medical equipment ranges from sparse to non-existent, shed a grim light on the aftermath of Ebola and its setback of maternal health care. Poverty and civil war, in addition to the unraveling of the healthcare system due in large part to the Ebola crisis, have virtually undone any small steps African countries had taken toward fostering a safe environment for women to have children. In 2000, the United Nations made a pledge to achieve a series of Millennium Development Goals (MDGs), which included the reduction in the maternal mortality ratio (maternal deaths per 100,000 live births) by 2015. There is no question the aforementioned upheavals disrupted the pursuit of these MDGs, particularly in rural villages throughout Africa. It comes as little surprise that developing regions account for a near-monopoly over the occurrences of global maternal deaths—approximately 99 percent, according to the 2015 report Trends in Maternal Mortality. On a similar global scale, three million newborns die each year, and more than two million babies are stillborn. Africa represents over half of both figures. Before Ebola, places like Sierra Leone and Liberia already accounted for some of the world’s most alarming maternal and infant death rates; however, the rate had started to show slight improvement. In 2010, there were 890 and 770 maternal deaths in the two countries, respectively. Both of these figures were significantly less than totals from years prior (1,110 in 2005 in Sierra Leone and 330 in 2000 in Liberia). It is too soon to compare these figures with the rate of maternal and infant deaths post-Ebola, but if the approximately 120,000 Ebola-related maternal deaths is any indication of the epidemic’s impact on childbearing women, its prolonged consequences on maternal health will also be dismal. While coverage of the Ebola catastrophe has lost steam, the crisis is still very real and relevant in countries especially languishing from its toll. NPQ recently broke down the astonishing amount of financial pledges that have gone unfulfilled in Africa’s western regions, totaling as much as $1.9 billion, a likely consequence of poorly monitored international aid and perhaps a mismanagement of the outbreak overall. Undoubtedly, these mishandlings are making it exceedingly difficult for certain countries to escape Ebola’s downward spiral. Despite the monetary support that has made its way to countries in need, the lingering effects of Ebola continue to interfere with the provision of care. According to the New York Times piece, Ebola further fragmented a health system that was barely there in the first place, claiming the lives of many skilled hospital workers and contaminating the minimal amount of safe health clinics, forcing prolonged closures and ultimate permanent shutdowns. During the height of the outbreak, the presence of the virus and the likelihood of contracting it had an indirect effect on others in African countries seeking care for more treatable injuries and conditions. As NPQ reported in 2014, many individuals avoided receiving care for such ailments for fear that they would be infected with Ebola in places where they should have been protected. That fear still haunts mothers needing a clean and safe place to deliver. The hospital workers who thankfully did survive the outbreak are hesitant to return and pregnant women are resorting to sub-par clinics and hospitals in an attempt to avoid being exposed to the virus. The Changing Woman Initiative is a local nonprofit that aims to improve healthcare for American Indian women in Northern New Mexico, in part by reviving cultural traditions that have nearly been shut out over decades of increasingly medicalized approaches to childbirth.